Carrying forward the results of a team that created a pig/human hybrid last year, a team led by researchers at Stanford University has created a sheep/human hybrid. The team has not published a paper on their efforts as yet, but recently gave a presentation outlining their work at this year's American Association for the Advancement of Science meeting in Texas. As with the team last year, the current researchers say the purpose of creating the human-animal hybrid was to find out if it might be possible to grow human organs in animals to replace defective ones in humans. Such patients would not reject the organs, because the cells used to create them would be their own. The researchers used a sheep in their experiments because its organs are roughly the same size as humans and because in vitro fertilization of sheep is easier than pigs. The process of creating a hybrid starts with collecting human stem cells, which can grow into any kind of organ. Next, an embryo is harvested from an animal such as a pig or sheep, and its DNA is modified to deactivate the part that would normally be in charge of developing the desired organ, for instance, a liver. Then the human stem cells are inserted into the embryo, which is implanted back into the uterus of the animal that donated it. In this manner a human organ, such as a liver, could be caused to grow inside of a volunteer animal—the embryo would grow into an adult pig or sheep with a human organ inside of it, instead of its own. The researchers noted that in their work, just 0.01 percent of the cells in the sheep embryo were human, the rest were native sheep cells. Much more than that would be required to actually grow an organ, perhaps as much as 1 percent. The embryos were also not allowed to mature into adults—they were killed after growing for 28 days. Such research tends to be contentious—some are firmly for it, while others believe it is unethical. NIH, for example, currently does not allow such research using money from the government. Many believe that as researchers move closer to allowing hybrid embryos to grow into adults, more voices will be raised against it. 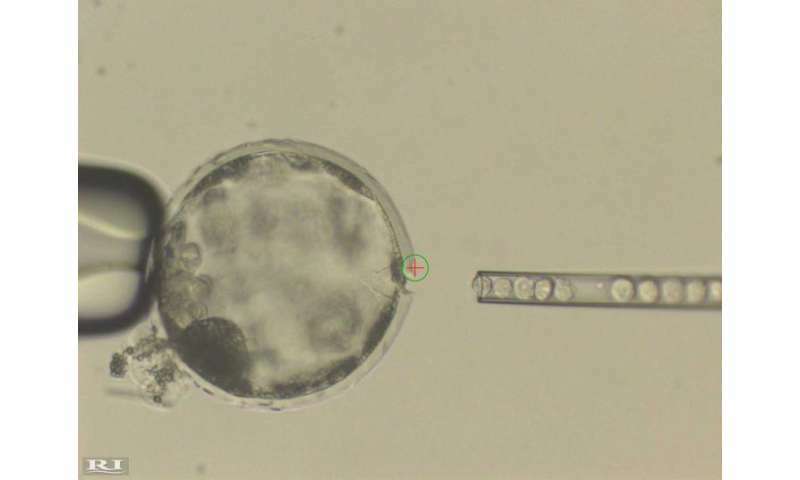 Interspecies blastocyst complementation offers the possibility of generating human organs in animals. The approach requires a host embryo for which development of a specific organ is genetically disabled and human cells with interspecific chimera formation potential. I will present results on the use of CRISPR-Cas9-mediated zygote genome editing for creating pig and sheep organogenesis-disabled host embryos. Also, to address whether human pluripotent stem cells (hPSCs) can contribute to chimera formation in livestock species we systematically evaluated the chimeric competency of several types of hPSCs. The procedures and observations that will be presented regarding the capability of human pluripotent stem cells to integrate and differentiate in an ungulate embryo may constitute a first step towards realizing the potential of interspecies blastocyst complementation for xeno-generating transplantable human tissues and organs towards addressing the worldwide shortage of organ donors. If properly regulated, growing replacement human organs in farm animals could be the answer so many suffering and dying people have hoped for. Such research should be supported and brought to fruition as soon as the science allows. unethical? what, why do people want to limit progress? Its like modifying human genes for radiation hardening/space travel. OH dont do that, your playing god! Its unethical to have these types of people around, its time for scientists to start wielding the true power they have instead of succumbing to ethical people. Not all of the ethical people have the money!!! Human animal chimeras are very dangerous as they provide a perfect media for animal pathogens to become human pathogens. We are doing these things with too little concern or restraint. "The human species began as the hybrid offspring of a male pig and a female chimpanzee, an American geneticist has suggested. "The startling claim has been made by Eugene McCarthy, who is also one of the world's leading authorities on hybridisation in animals. "He points out that while humans have many features in common with chimps, we also have a large number of distinguishing characteristics not found in any other primates." These pansies should have allowed the embryos to mature, what exactly was stopping them, a social media outcry by a bunch of low-IQ monkeys?. There's a good chance some team in China is more advanced in this field by now, but they don't make it public yet. An organism with a combination of two (or more) genetically distinct types of cells is a chimera, not a hybrid. Scientists should know the difference. Hybrids are when all cells in the organism share DNA from two different parents. How does this address his point regarding cross-species pathogen transmission? "In this manner a human organ, such as a liver, could be caused to grow inside of a volunteer animal" ? how, exactly, did the researchers know that the animal volunteered? what idiocy. unethical? what, why do people want to limit progress? I think what really scares reasonable people is the thought of animals, grotesquely mutated with human features. Imagine them with some sense of human level consciousness...maybe they have limited speech? Until they get chopped up for organ harvesting that is. It can get very freaky. Of course properly regulated it shouldn't be a problem. Then you'd only have to deal with the unreasonable people's die hard ethics.